Our internal affairs blog. Get up to speed on what we have planned next. Congratulation to Alexander Perez, the recipient of this year’s Doug Leslie Bursary! This bursary was created in memory of Leslie, who served as The Link’s first Editor-in-Chief. Through organization troubles and a shortage of staff, Leslie overcame financial struggles to successfully guide the merger of two campus papers, all while ensuring the publication’s independence. Working in student media is a labour of love. 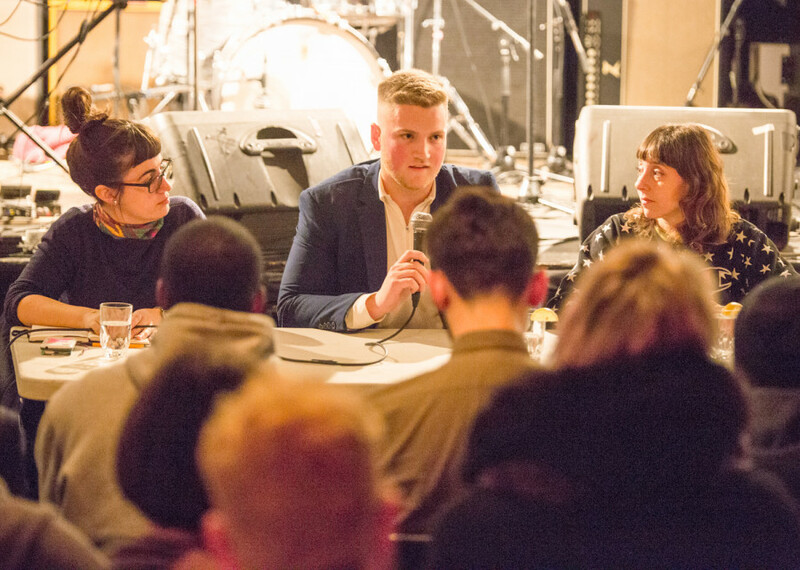 This annual bursary acknowledges the long hours The Link’s contributors put it by awarding one recipient with $1,000 or two with $500, based on their contributions to the publication and their financial need. A very special thank you is due to our committee: former Linkies Michelle Pucci, CBC Nunavut, Phil Authier, Montreal Gazette, and Colin Harris, Montreal Gazette, representative from Concordia’s Dean of Students office, Paul Groubko, and Julian McKenzie, representative from The Link’s Board of Directors. Your time, effort, and constant support are endlessly appreciated. Recorded from The Link’s Gender and Sexuality launch party at Kafein Bar, Fringe Arts Editor Shannon Carranco and staff writer Ireland Compton welcome Kelly Holzmulle, also known as Will Charmer, and Lisa Morrison, also known as Lizzy Strange. The two drag performers, Holzmulle a drag king and Morrison a hyperqueen, who were featured in an article from the Gender and Sexuality special issue written by Erika Morris, add to what they shared in the piece. They talk about their starts in drag, what it takes to transform into their characters, their relationship with gender and advice for people who are interested in the drag scene but don’t know how to get in. By-Elections: Photo, Graphics and Copy Editors! Do you have a passion for photography? Are you a visual artist? When you read an article, do you pick it apart and think of ways to improve it? If any of those things describe you, then we’ve got some good news for you! The Link is looking for a new Photo Editor, Graphics Editor, and Copy Editor. What does that mean? Here’s a basic job description for each position. Photo Editor: Your job will be to coordinate with section editors to make sure that all the stories that need photos will have a photographer. You’ll look to recruit a team of photographers and work with them constantly to improve their skills. You’ll also edit photos sent by contributors, and be the photographer yourself when no contributors are available. Graphics Editor: Similar to photo editor, but for stories that require graphics instead of, or in addition to, photos. 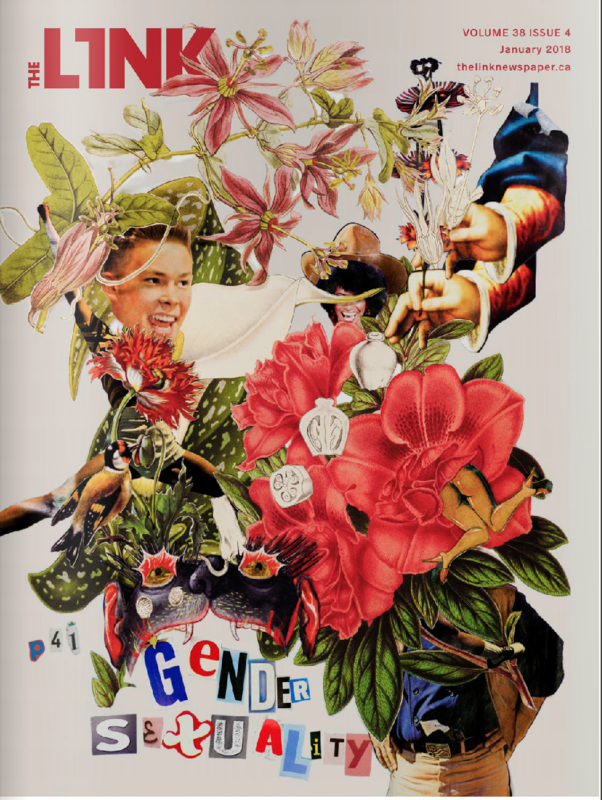 Your job will be to recruit and manage a team of artists and assign them stories to make graphics for. Copy Editor: Your job is to look over every story that we publish and fix it up. That means you’ll be making sure that articles abide by our style guide and mandate, are meticulously fact-checked, and that the writing style is readable and compelling. The by-elections will be held on Tuesday, Jan. 23 at 5 p.m. in our office in H-649, just before our regular pitch meeting. Those interested in the positions must submit a one-page cover letter explaining why they think they’d be a good fit for the position they’re applying for. This letter must be submitted no later than Tuesday, Jan. 16 at 4 p.m., along with a portfolio of three relevant contributions to The Link. The letter must be posted on the wall of The Link office. Please email editor@thelinknewspaper.ca with any questions. Eligible staff: Mark Di Franco, Dustin Kagan-Fleming, Erika Morris, Eric Beaudoin, Daren Zomerman, Elias Grigoriadis, Shreya Biswas, Ireland Compton, Marissa Ramnanan, Penina Simon, Elisa Barbier, Deanna Hewitt, Aiden Locke, Elaine Genest. One more contribution to be eligible: Ion Etxebarria, Olivier Cadotte, Victoria Lamas, Fatima Dia, Aysha White, Amely Coulombe, Jeremie Gauthier-Caron. Two more contributions to be eligible: Gabor Bata, Natalia Blasser, Aakruti Patel, Cailin Woodward, Evelyn Hansen-Gillis, James Betz-Gray, Ninon Scotto Di Uccio, Simon New, Jeffrey Muntu, Caisse Doubleday, Matt Garies, Jillian Reynolds, Shakti Langlois-Ortega, Sarah Jesmer, Samantha Stevens, Victoria Lewin, Wala Amara. Anne-Marie Rivard (left), Trenton Miller (middle) and Dana Schnitzer (right) speaking on the panel. Photo Daren Zomerman. Fringe arts editor Shannon Carranco (left) and creative director Carl Bindman (right) moderated the panel. Photo Daren Zomerman. Anne-Marie Rivard is writing her doctoral thesis on access to abortion in Canada, and how it varies from region to region. She’ll be discussing how Canada still has much work to do to make abortion accessible. Trenton Miller was a quarterback for the Concordia Stingers, who was permanently sidelined due to a concussion that he suffered after a hit. He’ll be talking about his experience with physical injury, and how it relates to sports. Dana Schnitzer is an art therapist, whose practice helps patients deal with mental health issues—especially anxiety, depression, and ADHD. She will be describing how the creative process can help people deal with different mental health issues. Doug Leslie was The Link’s first editor-in-chief. When he passed away in 2012, a bursary fund was set up in his name. Every year $1,000 is distributed in his honour to Linkies in financial need, either entirely to one person or split between two. To be eligible, you need to be a staff member having contributed at least four separate times to four issues this semester. You must be registered as a student and returning next year. To apply, you’ll need to write us a one-to-two page letter, and have it sent to us before Nov. 28. It should describe your level of financial need, how you plan on contributing to The Link in the coming year, and how the bursary will help you do so. You’ll also need to include three of your contributions to the publication. 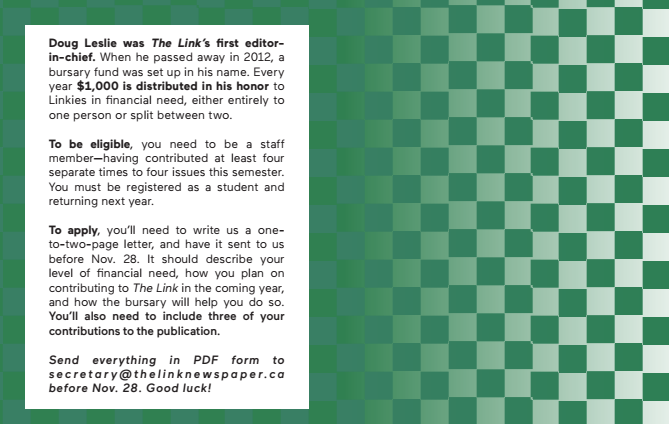 Send everything in PDF form to secretary@thelinknewspaper.ca before Nov. 28. Good luck! Eligible staff: Mark Di Franco, Dustin Kagan-Fleming, Erika Morris, Eric Beaudoin, Daren Zomerman, Elias Grigoriadis, Ireland Compton, Marissa Ramnanan, Penina Simon, Elisa Barbier. One more contribution to be eligible: Aiden Locke, Ion Etxebarria, Olivier Cadotte, Elaine Genest, Victoria Lamas, Amely Coulombe. Two more contributions to be eligible: Gabor Bata, Fatima Dia, Aysha White, Natalia Blasser, Shreya Biswas, James Betz-Gray, Ninon Scotto Di Uccio, Simon New, Jeffrey Muntu, Caisse Doubleday, Matt Garies, Jillian Reynolds, Shakti Langlois-Ortega, Sarah Jesmer, Samantha Stevens, Jeremie Gauthier-Caron, Evelyn Hansen-Gillis, Cailin Woodward.